The Havana peace process that officially started on November 19th 2012, has lasted more than two years already and just 3 of the 6 agenda points have been agreed upon. The good thing is that the process is still making progress and the closer it gets to the finish line, the less chance there is that it will be aborted. The peace process seems to be the germ of a broad public debate of how to redesign the Colombian state and society. But unlike what you'd expect, there are serious threats and counter-forces that are undermining the peace process. Lots of groups seem not to favor peace in Colombia. Former president and now senator Álvaro Uribe Vélez seems to be the spearhead of those groups. Let's look at those threats here. The Colombian army and security forces are an influential group that does not favor peace in Colombia for several reasons. If a peace agreement is signed, this group will suffer serious budget cuts and lots of military personnel will get fired. Most soldiers want to get even with the enemy and rather eradicate them than make peace with them. But what is often forgotten is that the army itself made (far) more innocent victims than the FARC did. The army and police forces do not favor amnesty for FARC-members, but almost all army and police force perpetrators of Human Rights Violations during the conflict, were never prosecuted and punished. Among them you'll find latifundistas (large landowners) who stole land of campesinos by paramilitary force and were guilty of ethnic cleansing; drugs barons, who made their fortune by narco-trafficking and invested their monies in all kind of industries; and numerous other groups who profited from the large US dollar influx from the drugs trade. These groups were able to bribe/buy/threat/kill the journalists/media, politicians, trade-unions, judges and police and army officers at a large scale to safeguard their interests. They have no interest in peace in Colombia, because they think peace in Colombia will unite the social classes and therefore they are afraid they might once be prosecuted and that their fortunes will be at stake. Private paramilitary organizations could be legally established in Colombia for many decades. The most important reason was to protect the kleptocracy from kidnappings and extortion and thus they were financed by the same kleptocracy and drugsbarons. But they soon became killing machines and they used terror abundantly. In 1997 these paramilitary organizations were united in the Autodefensas Unidas de Colombia AUC (20,000+ paramilitaries). The AUC had their own helicopters and intelligence units but were 'demobilized' during 2004-2006 by president Uribe. However, almost all paramilitaries received virtual amnesty. Uribe coined the leftovers of these paramilitaries "BACRIM" (bandas criminales emergentes) and those Bacrims were able to fight/regroup/reorganize themselves and become a professional organized crime syndicate operating today as a transnational franchise organization according to Insight Crime's Jeremy Mcdermott. It's obvious that these Bacrims and all groups that profit from their criminal activities do not want peace in Colombia, because that means that their businesses will be seriously jeopardized. When eventually a peace agreement is signed and FARC troops are demobilized then there is a chance that the BACRIM will take over part of the FARCs illegal activities, but also the army and police will have more resources available to fight the BACRIM. In Colombia the public opinion about the conflict has always been important. The public opinion determines to a significant extent voter's behaviour and the media play a very important role in this. For many years all official (dis-)information about the conflict was controlled by the DAS, the Colombian Intelligence Service. Also the media suffered (and is still suffering to some extent) from self-censorship. Many journalists who wrote too 'friendly' about the FARC/ELN have been threatened and/or killed. Big advertisers used to stop advertising in media that were reporting 'too friendly' about the conflict, forcing the media to stop investigative journalism and report more mainstream about the conflict. Politicians of the left who spoke in favor of socialism have been threatened and/or killed as well. So in Colombia the public opinion about the insurgency and conflict became very biased in all those years. A public opinion poll held in November 2014 showed that only a small majority of 55% supports the peace process. 45% just want the FARC to be exterminated, a strategy that was introduced by former president Uribe, but only caused much more violence and victims. The public still doesn't seem to understand that you can never win a guerrilla war. 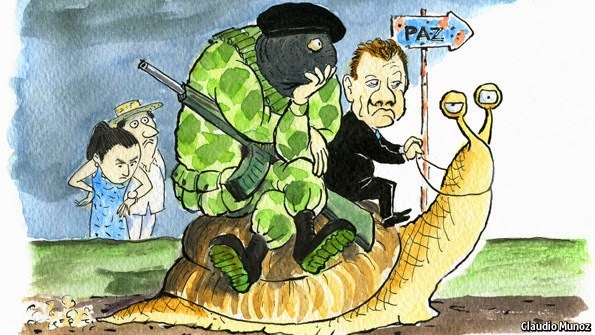 Although he may not realize it, president Santos is a threat to the peace process himself. Unfortunately he is not the strong charismatic statesman that is able to unite the Colombian people for peace and transformation. He frequently brakes his promises and he often makes stupid mistakes. The army doesn't like Santos for obvious reasons. Santos chose to perform the plate spinning circus-act and is trying to keep all his plates spinning, that is keeping all parties the least annoyed. For instance, he still refuses a bilateral truce. Santos suspended the peace process to set general Alzate free even when the general agreement on the peace talks prohibited this. He is continuously expressing his happiness on his Twitter account because of the death of guerrilla fighters. He is doing these things to show that he is not giving in on the enemy. Never the less about 50% of the public thinks he is too soft. Polls of August 2014 show that 50% disapproved of how Santos was conducting the peace talks. I think Santos has good intentions and wants to succeed in bringing peace, but he has no charisma and a weak strategy and he has great difficulty to combat public opinion. 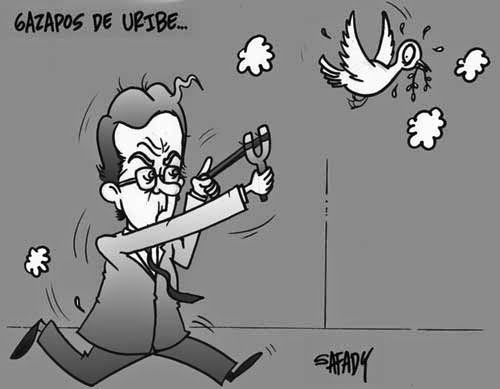 Former president Uribe (2002-2010) has become the spearhead in campaigning against the peace process. He is tweeting all day (actually his PR team is composing his tweets), he expresses his opinion in every thinkable way, he wrote a book, founded and sponsored a new political party Centro Democrático, sponsored a presidential candidate, is continuously criticizing president Santos and Uribe became senator himself just to thwart the peace process. While Uribe started secret negotiations for peace with the FARC during his last term, he still strongly believes that the FARC/ELN should be defeated and/or exterminated. Uribe decreased the FARC's ranks considerably during his terms, but at an enormous cost of much more violence and victims. He proved during his two terms that defeat of the guerrilla isn't possible. On the other hand Uribe is a strong opponent of amnesty for the FARC-members. During his presidential terms more than 90% of AUC-members received virtual amnesty and human rights violators in the army were not prosecuted. The next item on the agenda of the peace talks 'End of the Conflict', that starts in January 2015, could be the moment of thruth for the peace process and Colombia. Amnesty, demobilization, transitional justice, bilateral cease fire are all items that several parties have strong opinions about. It is very thinkable that Uribe will now focus in his political PR campaign against the peace process on the human rights violations that individual FARC delegation members are suspected from, just to prevent that amnesty will be part of the agreement.